For the homeowner, it is an easy way to improve the appearance of the roof edges, while ensuring next to no maintenance will be required for years to come. This article addresses the costs of replacing fascias and soffits with the durable Upvc. For a typical 3 bedroom semi-detached house on two floors, replacing soffits and fascia board will require the erection of scaffolding. The price guide below assumes there are no access issues for scaffolding erection such as conservatories or parked vehicles which cannot be moved. The price does not include any remedial work to structural timbers, which are assumed to be in great condition. The house has a tiled, two hip roof with gutters to the front and rear of the property. Replacement tiles and waste – £50. The job will take two men a total of three days to complete. The above is an average price for the job and variations in prices can be expected across the different regions of the UK. If you want the gutters replaced at the same time then extra costs will also apply. Additional scaffolding to bridge across a conservatory. Timber replacement to rotten rafters. Extensive cement work to gable or apex. 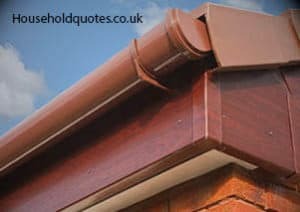 Why replace fascias and soffits? So why should you replace fascias and soffits? Hopefully it’s not just because someone knocked on your door and made you an offer you simply couldn’t refuse. Unlike soffits which are tucked safely away from the weather, fascias bear the brunt of the rains and snow. Cladding the existing fascia boards with UPVC panels – this is the cheapest option but if the fascia boards are falling apart the cladding won’t hold. Cladding could be an option for new timber fascia boards to protect them against wet weather. The second option is to rip out the weather damaged fascia boards and replace them with new timber fascias. If you love painting and maintaining your fascias then this could be an option for you. Timbers will require preservative treatment before putting up. The recommended option is to replace wooden fascias with UPVC fascia board because UPVC requires very minimal maintenance and is weatherproof and therefore durable. Repair and replacement of guttering. Installation and repair of rainwater downpipes. Roof tile repairs and replacements while you have scaffolding for easy roof access. Minor repairs such as cement pointing or repairs to roof rafters. Getting quotes for all the extra work you need doing is very important because you will know how much the whole project will cost, and if you have the budget for it. I have heard about fascia capping is it better than replacing with UPVC fascias? To reduce the cost of replacing fascias and soffits, some homeowners opt for capping or cladding instead of replacement. This could be a viable option if the fascias and soffits are still in excellent condition and will work to preserve them. However, if the timber is in poor condition and falling apart, we do not recommend capping. Requesting quotes for both types of work and receiving professional guidance on the best way forward for your particular situation. UPVC capping prices may be lower than replacement but at the end of the day timber will deteriorate faster than UPVC so you may want to consider durability when you make your decision. Finding the right tradesman to trust can be a challenge. You can use Rated People to find tradesmen in your area. You just need to enter your details and a brief description of your job and they’ll do the rest for you.